Kratos returns to PSP with a bigger and more realistic looking adventure. After finishing God of War III and seeing the epic trilogy to its end, we wondered how long it would take for Kratos to reappear. Today, Sony answered that by announcing the latest chapter in its award winning franchise, God of War: Ghost of Sparta, arriving this year on the PlayStation Portable. As expected, the game doesn't pick up after the events of God of War III. 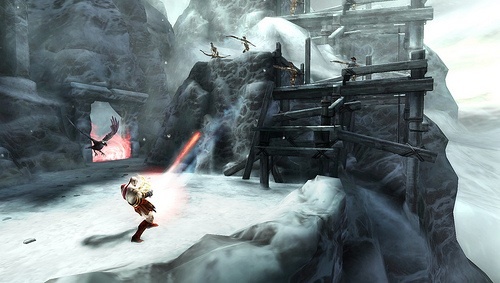 Instead, Ghost of Sparta occurs between the first and second game, during the time when Kratos (the newly appointed God of War) learns how to wield his new powers. To stamp out the nightmares that terrorize him (he did slaughter his family, after all), the murderous Spartan must embark upon a dangerous quest that'll take him to new worlds populated with all sorts of mythological creatures and undead soldiers. Thankfully, he plans to bring his razor sharp Blades of Chaos along for the trip. "Excitement for the God of War franchise is at an all-time high and we're thrilled to continue that momentum with God of War: Ghost of Sparta," said Scott A. Steinberg, vice president, product marketing, SCEA. "This new adventure will showcase Kratos on PSP like never before in an experience that fans and newcomers can enjoy on the go, anytime, anywhere." Ready At Dawn Studios, the same company that created the acclaimed God of War: Chains of Olympus, will handle development for Ghost of Sparta. Although details are scarce, the team hopes to add higher quality locales to explore, more boss encounters/enemies on screen, new magical powers and weapons, lifelike characters and 25 percent more gameplay than Kratos' previous PSP adventure. Hopefully, this will be the shot in the proverbial arm that Sony's handheld desperately needs. With both Nintendo and Apple carving large chunks of portable market share, it's about time Kratos step in to remind us all why we purchased PSPs in the first place. Expect more info at this year's Electronic Entertainment Expo. In the meantime, drool over these screens.